Scuba diving is no longer an exclusively professional activity. Under the guidance of professional experts and proper equipment, anyone can become a scuba diver and live this bewildering experience. If you’ve never tried scuba diving at all, you will surely love scuba diving in Cancun and its surrounding locations. Located beside the crystal-clear Caribbean Sea, Cancun is the perfect place to enjoy some amazing scuba diving destinations. Whether you’re a beginner or have logged plenty of dives, the waters here are teeming with spectacular coral and marine life, thus making Cancun scuba diving – a must try activity. Following are some of the best dive sites in the area, from shipwrecks and steep wall dives to relaxed reefs. Manchones, Isla Mujeres – This popular dive site is full of divers and snorkelers all throughout the day, but come here for a night dive and you will enjoy the views of the reef without the crowds. Turtles gather at night at Manchones Reef. Explore Manchones with flashlights to observe some of the more elusive marine life that are usually hidden away in the caves and corals during daylight hours. You'll come across plenty of sea turtles, eels and octopus. This site can be best explored by the beginners and advanced divers alike. Aquarium, Puerto Morelos – While diving, you will be surrounded by fish from all sides. Located at a 15-minute boat ride from Puerto Morelos, the aquarium is an ideal spot for beginners looking to try their hand at scuba diving in Cancun. Here the divers can come across large schools of French grunts and porkfish, plus lobster, eels, trumpet fish, turtles, rays and puffer fish. This site lives up to its name as you can also come across large formations of finger corals, sea fans, and sponges. Gatas, Puerto Morelos – Your hunting for lionfish ends here at Gatas! Located 20 minutes away from Puerto Morelos, this is the place where scuba instructors go fun diving near Cancun. The advanced drift gives divers a glimpse of nurse sharks, turtles and lobsters here. Adrenaline junkies can be part of lionfish spear hunting tour of Gatas. Lionfish is a venomous fish that has invaded the Caribbean Sea in large numbers and endanger the local marine life, so divers have been permitted to hunt them to control their numbers. Shark Point, Playa del Carmen – Who would dare miss an opportunity to get close to bull sharks? The warm and crystal clear waters make Playa del Carmen one of the top places in the world to dive with bull sharks. The advanced divers can also try swimming with whale sharks. Bull sharks are a fierce ocean predator reaching up to four meters in length, who feed on fish, turtles and even other sharks. Step into the water and get close to these beautiful creatures in their natural environment. Palancar, Cozumel – All those who want to see magnificent sponges under the water, this is the place to be! Without a doubt, Cozumel is one of the best diving spots near Cancun. With absurdly good visibility, swift current and steep walls, there are many dive sites to explore and are home to a wide variety of marine life including turtles, sharks, crabs, squid and seahorses. A good starting point for beginners and intermediate divers, you can also spot rock spires and cliffs which are covered in magnificent corals and sponges. Caones, Puerto Aventuras – You can end up spotting many turtles at this particular dive site. Puerto Aventuras is considered to be a good dive site for beginners as well as advanced divers who are looking for a relaxed experience without crowds of other divers around. Due to its location in close proximity to the shore, the current is usually mild. Caones has spectacular coral canyons that look spectacular due to different types of sponges and corals inhabiting the area. You will be able to view turtles, lobsters, porcupine fish, rays and barracudas here. You might end up swimming alongside friendly turtles. 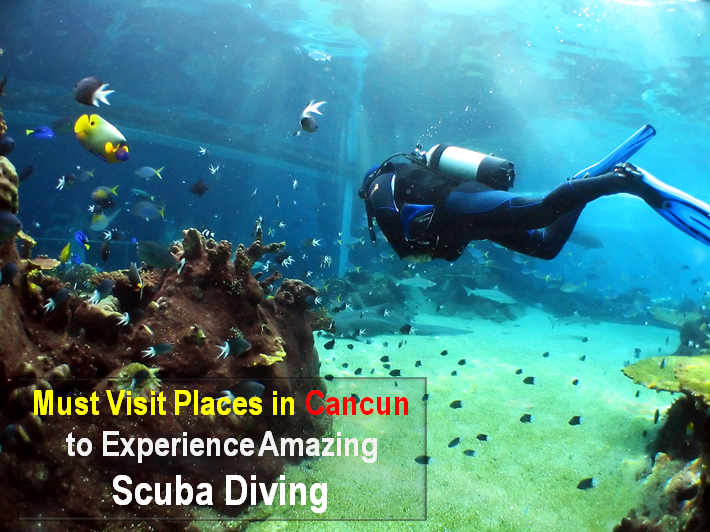 If you love scuba diving, and you do not know which locations are suitable for you to have an amazing experience of scuba diving in Cancun, the above-enlisted places in and around Cancun will surely provide you with a memorable Cancun scuba diving escapade.